The updated synopsis for The Avengers: Infinity War reveals that Thanos will "inflict his will on all of reality." Marvel has been building up to this point for almost a decade and it's about time to see the payoff. The Avengers will team up with the Guardians of the Galaxy to stop Thanos from gaining all of the Infinity Stones in the biggest comic book movie to date. No specific plot points have been given away, but this is the first official synopsis that we have seen for Avengers: Infinity War. The new synopsis comes from License! Global Magazine, which also reveals plots for Black Panther and Thor of Ragnarok. Read the synopsis for Infinity War below. "As the Avengers and their allies have continued to protect the world from theaters to large for any one hero to handle, a new danger has emerged from the cosmic shadows: Thanos. A despot of intergalactic infamy, his goal is to collect all six Infinity Stones, artifacts of unimaginable power, and use them to inflict his twisted will on all of reality. Everything the Avengers have fought for has led up to this moment - the fate of Earth and existence itself has never been more uncertain." While this isn't anything new, it does highlight the sense of urgency of the movie and provides just how far the evil of Thanos is willing to go. This will definitely pit the Avengers and allies up against their biggest enemy to date. The allies brought in to help the Avengers fight Thanos mentioned in the synopsis are obviously the Guardians of the Galaxy who are known to have their own beef with Thanos. Iron Man and Captain America will be pitted against a villain that is far too superior for their powers and will likely have to call on the Guardians for some extra help, though it isn't revealed specifically how this meeting will take place. It is rumored that Tony Stark will reach out to the Guardians for some galactic help to take down Thanos. Josh Brolin's portrayal of Thanos has been teased since the first Avengers movie and he's a had small part in Guardians of the Galaxy Vol. 1, but was left out of the sequel. Guardian's director James Gunn has said that Thanos was left out of Guardians of the Galaxy Vol. 2 because the plot is focused more on the two sisters, Gamora and Nebula, not their father. 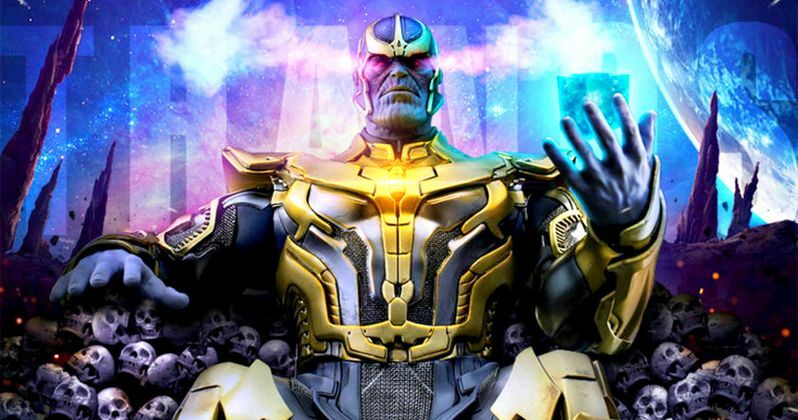 But while Thanos is not in the movie, his sense of evil and depravity are firmly placed into the story, revealing just how ruthless Thanos can be. Thanos easily destroys his family, what kind of evil can he unleash into the universe? Infinity War is said to be a culmination of everything that the MCU has worked towards starting with 2008's Iron Man. It's hard to believe that it has been that long. The excitement for the movie that has been kept under wraps is starting to get out of control. But like everything, as the release date gets closer, so do the spoilers. Expect a lot of new details to roll in in the coming months regarding the story line and specific plot points.